The Utah Division of Wildlife Resources (DWR) is going to the public for reactions to its proposed changes for the 2016 elk hunts. The current herd count is somewhere in the neighborhood of 81,000 animals, and that’s a number that has made managing herds and distribution a priority of the agency. The increase in elk population is a result of population objectives established by DWR, compounded with “obtaining harvest on private lands that manage for elk and movements of elk from tribal lands to public lands during winter.” Quality habitat is key to developing healthy and productive herds, however, “crucial Utah elk habitats are constantly being fragmented or lost due to road construction, OHV use, and energy development,” according to DWR. With the circumstances as they are, DWR has put forth a plan to more effectively manage herd size. 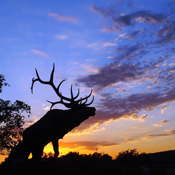 The root of the proposal is to increase hunting opportunities beginning with the 2016 elk hunts. Firstly, hold two elk hunts simultaneously by doing something that has never occurred before in Utah—“allowing limited-entry rifle elk hunters and general spike rifle elk hunters to hunt some of the same units at the same time,” and secondly, providing more hunting on private lands. Five units would be affected by the two elk hunts: the Box Elder, Grouse Creek unit; Paunsaugunt unit; Plateau, Fish Lake/Thousand Lakes unit; South Slope, Diamond Mountain unit; and the West Desert/Deep Creeks unit. Additionally, DWR’s proposal included the provision of incentive programs for landowners to make available more hunting opportunities on private lands, and a private-lands-only permit was proposed to encourage hunters to target cow elk on private properties. The public can respond to these proposals by e-mailing the Utah Regional Advisory Council member in their area. Member information can be found at http://wildlife.utah.gov.